In the days when I had a proper job that involved changing out of my pyjamas, leaving the house and eating something slightly more varied than fishfinger sandwiches every day, there were many things that I loved about central London. The view up the river from Waterloo Bridge never lost its ‘Wow’ factor. The man selling peacock feathers outside Farringdon station always made me smile. And the winter arrival of the hot chestnut sellers counted down the festive season like some kind of hot nut-based advent calendar. My two favourite spots were outside the British Museum and on the South Bank, halfway between Borough Market and Waterloo (although I think the latter may have now given way to some sort of caramelized nut thingies, tut). It was the evocative smell – all smoky and roasty – that I loved, as well as the ritual of juggling half-burnt nuts from hand to hand and trying to get the skins off whilst trying to avoid the inevitable shard of shell that gets stuck under your thumbnail. Roasted chestnuts seemed like a perfect companion for this month’s Cheese, Please! 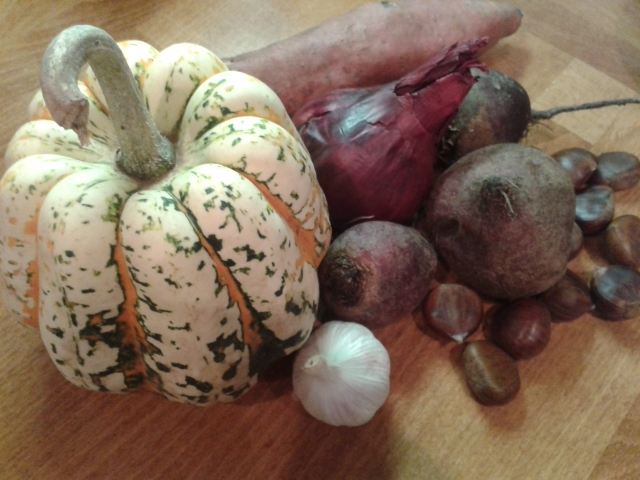 Challenge choice, smoked cheese, as did roasted root vegetables. 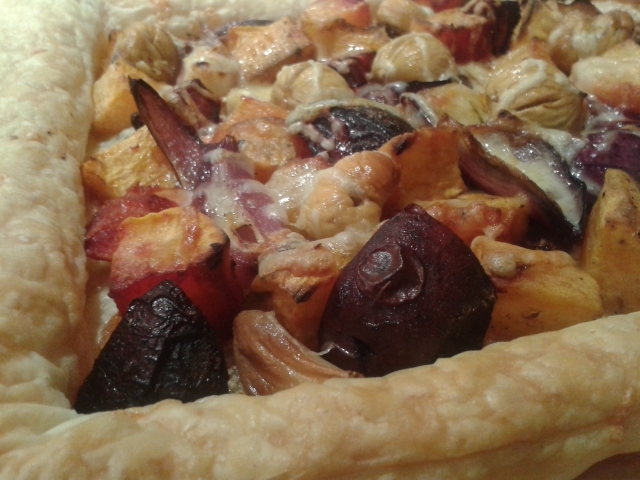 I am a big fan of puff pastry tarts since making a Fennel Goat’s Cheese, Tomato and Samphire Tart earlier this year and so decided to combine it all in a smoky, garlicky mess of caramelised vegetables. 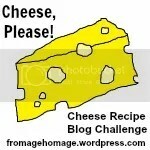 The cheese I used was a Smoked Cheddar from Green’s of Glastonbury; the cheese is matured and then smoked over oak chips. You could any other smoked cheese – a mozzarella would be sublime. Or, of course, a non-smoked cheese. Preheat the oven to 200˚C / 180˚C fan assisted / Gas Mark 6. Make a slit in the flat sides of the chestnuts with a sharp knife. Put them on a baking tray and roast for 15 minutes. Leave to cool and peel them as soon as you can. 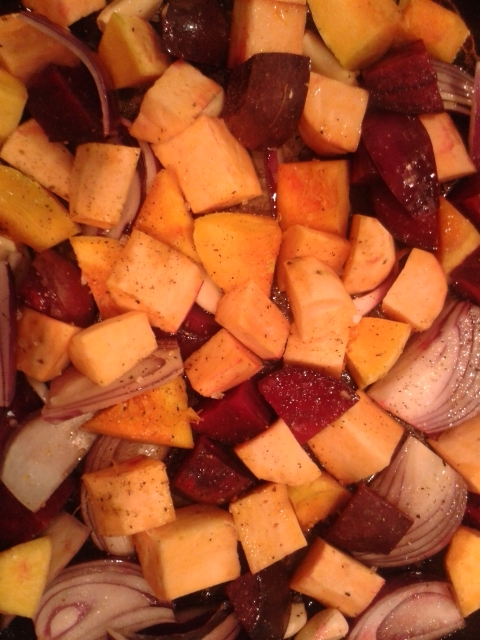 Cut the root vegetables into one-inch chunks and put them in a roasting tray with the red onion and garlic cloves. Season with salt and pepper, toss in olive oil and roast them for about 30 minutes or until nice and soft. Remove from the oven and turn the temperature up to 220˚C / 200˚C fan assisted / Gas Mark 7. Remove the pastry from the packet and unroll it onto a baking tray. Score a line about 2cm from the edges, all around the pastry. This will make the edges puff up nicely. Spread the soft cheese all over the bottom of the pastry and then sprinkle half of the grated cheese on top. 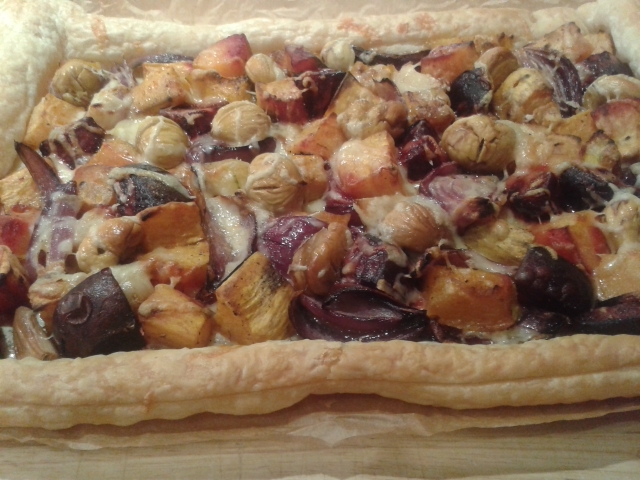 Arrange all of the roasted vegetable chunks, garlic cloves and roasted chestnuts over the bottom of the tart and spread the rest of the grated cheese over the top. 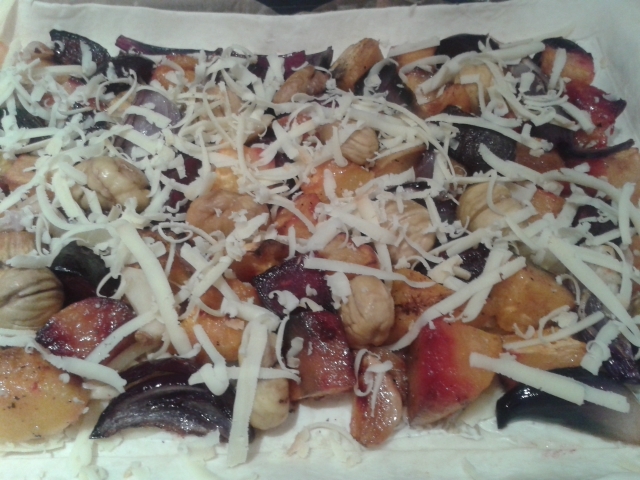 Bake in the oven for 20 minutes, until the pastry has puffed up nicely and the cheese has melted over the top of the vegetables. Serve with a green salad. I am adding this to November’s Cheese, Please! Challenge. Yes, the feta and mature cheddar will be perfect and sharp against the sweet vegetables – lovely. let me know how it goes. It was delicious! The feta was perfect. I shall make it again.